I’m happy to announce, officially on Muddy Colors, my first European Solo Show opening this October 17th at Gallerie Daniel Maghen, in Paris. If you find yourself nearby, please stop in. There’s no title for it yet, but the show is generally my adventure paintings. I’ve been thinking about this show for many months, but have been preparing it for years. From science fiction and fantasy to literary and historical themes, it will include book cover work, personal visions, and many pieces from the Wandering Star edition of The Conquering Sword of Conan. A couple paintings from stories I’ve painted for National Geographic Magazine will hang as well. This is the first of a series of posts about new paintings for the show that I’ll preview for Muddy’s followers. 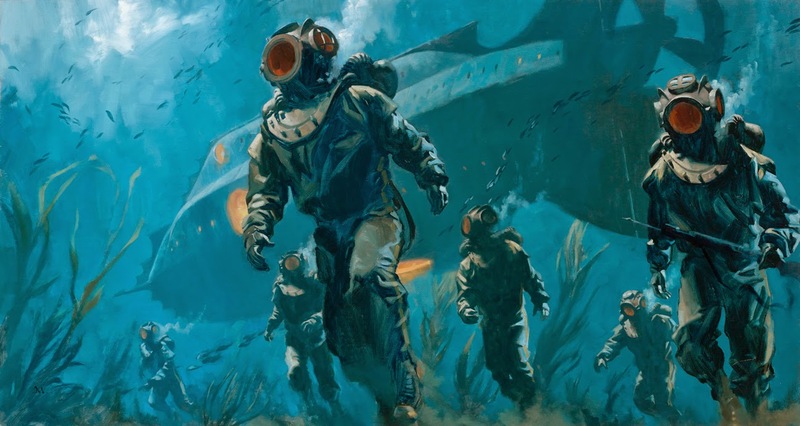 Just off the board late last week is a painting based on the Jules Verne novel, 20,000 Leagues Under the Sea (referring to distance, of course, and not depth...I was confused by that as a kid). The title alone is intoxicating. There are so many scenes to work with from the novel, but this painting isn’t for a cover, or an inside illustration for the book. This is solely for lovers of the story to be excited by. Entitled, The Harvest, it's iconic, with elements of the story, envisioned with my own personal approach. Very different than reporting a scene from the pages. 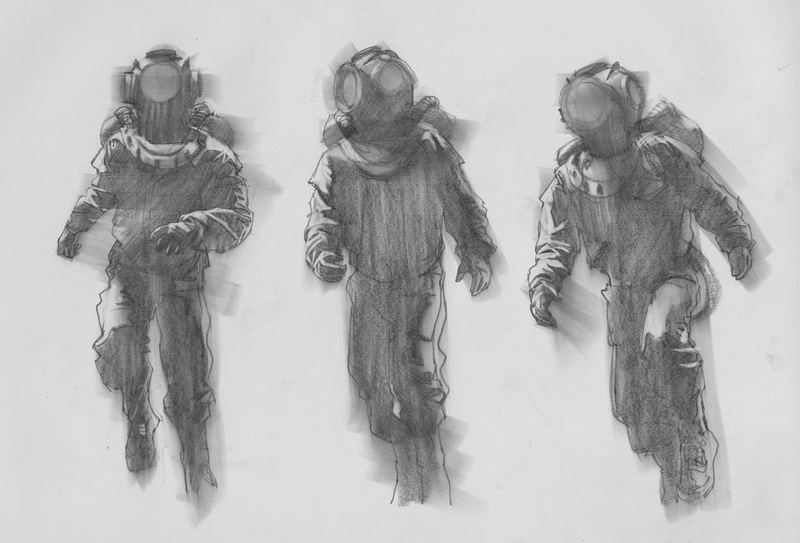 I tromped around the studio in a jury-rigged costume, shooting reference of me doing the spaceman walk on the ocean floor. 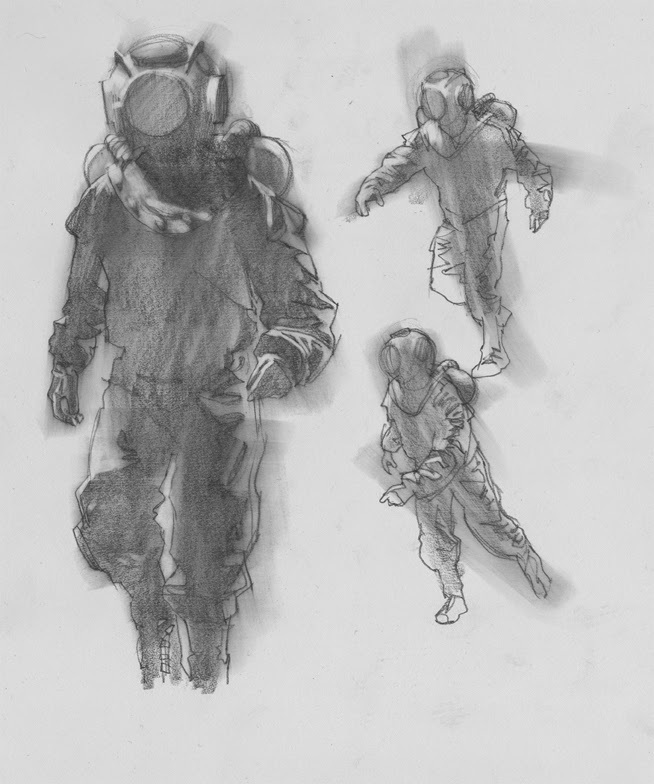 Then I gathered all the helmet reference I could collect and redrew each figure separately. 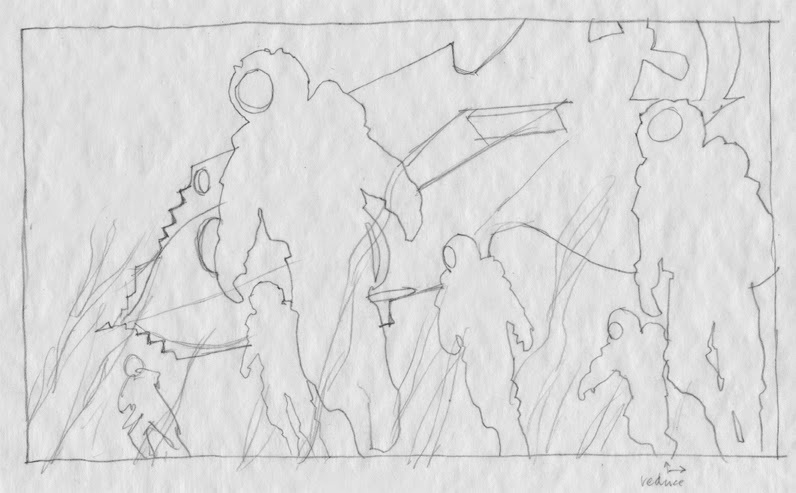 Lastly, I traced off the figures, cut them apart and moved them around to build the composition, then retraced the final version. This allows me to stay flexible with the placement of overlapping forms. As always there were things I wanted to show off, but I had to stay strong and let go of favorite elements in order to preserve the integrity of the whole piece. 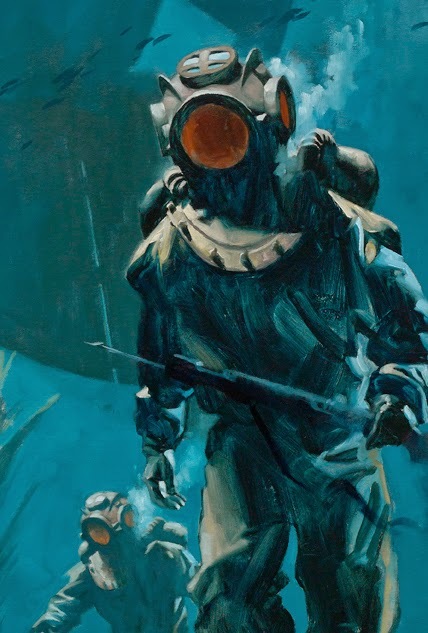 For example, I really liked the light on the bent arm of the figure behind the main diver, but it had to be sacrificed so that the two figures could work better as a unit. I designed a Nautilus that was my own, based on the text. It’s remarkable how accurate Verne is to the sub’s dimensions in the book, even for 1870. It’s tough to get away from the Disney version, even when changing all the general shapes. One thing I did focus on is the direction of the forward serrated edges used to rip open ships from beneath. If the edges angle backwards, the Nautilus would get lodged in the ships’ hulls, like a barbed hook. Pointing forward allows it to tear and move away quickly. All of that is fun to think about and include, but the overall feeling is the presiding idea. Generally, I was happy with the motion in the scene, the light, the fish, and the color. I'm planning a series of paintings from not only this story, but from other Verne novels as well.